Dogfish Head Craft Brewery Founder and President Sam Calagione is an interesting guy. In addition to being a boundary-breaking craft brewer and entrepreneur, Calagione recorded a hip hop album in 2003. (Seriously, he and Dogfish Head brewer Bryan Selders form The Pain Relievaz. See the video clip below. Note: I never said it was a good hip hop album.) Calagione has a college degree in English, though he was kicked out of high school in Western Massachusetts and never received a high school degree. He was a Levi’s model. He literally changed the laws in Delaware in order to open the original Dogfish Head brewhouse, which was the first brewery in the nation’s first state. You get the point. 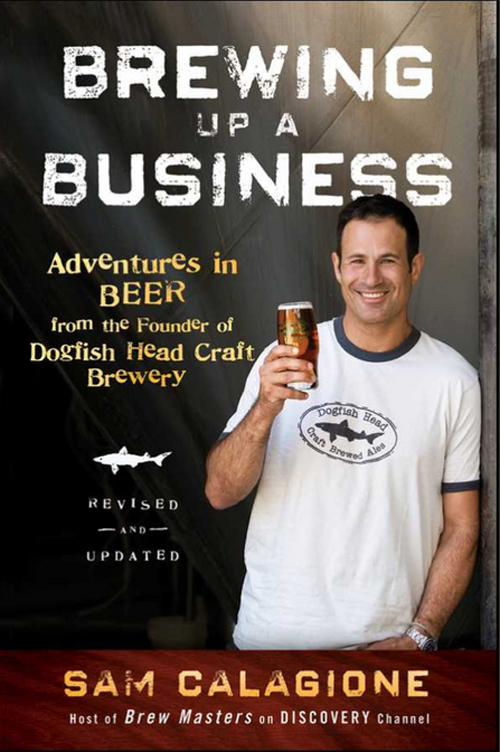 I know these things because I just finished reading Calagione’s small-business oriented book, Brewing Up a Business: Adventures in Beer from the Founder of Dogfish Head Craft Brewery. Calagione’s book is really about how to prepare to launch a small business and then make it successful, so it’s not for all craft beer aficionados. You’ll probably need some degree of interest in small business or entrepreneurship to get the most out it. But I’m no business owner or entrepreneur, and I really enjoyed the book because I’m a huge Dogfish Head fan, and it’s full of little-known facts and anecdotes about Dogfish and Calagione. 1) Calagione was on the Ricki Lake show, and Lake tasted the first beer he ever brewed. That first beer was a pale ale made with cherries. And Ricki Lake attended the party he held to taste it shortly after he appeared on Lake’s show. 2) Dogfish made a malt liquor called Liquor de Malt, to prove it could make a better in that style than the established 40-ounce makers. 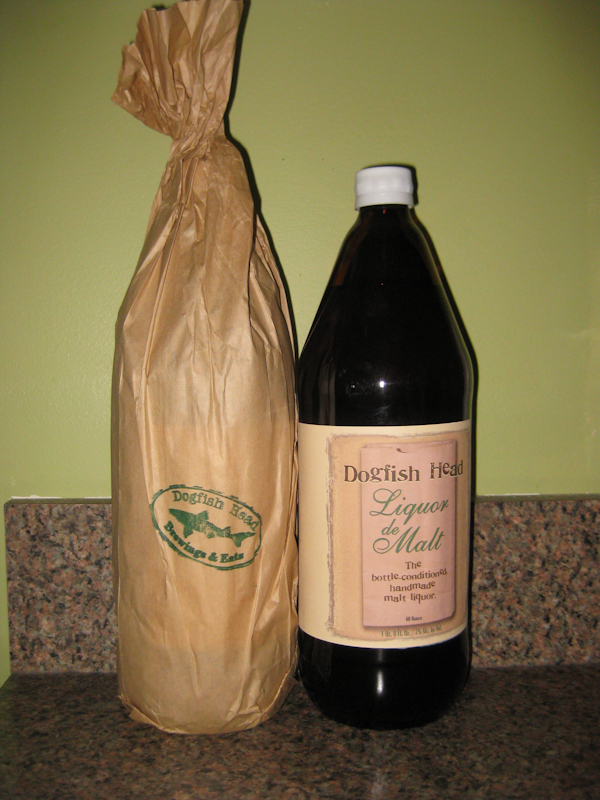 Liquor de Malt was packaged in a 40-ounce bottle that came with a hand-stamped, Dogfish brown bag. 3) Dogfish fans visiting coastal Delaware who want the ultimate brewery and brewpub tour can participant in the Dogfish Head 360 Degree Experience, which includes a hotel room at a local inn that’s customized with Dogfish memorabilia, meals at the brew pub and a boat ride to the Dogfish brewery, where they’ll receive tours and tastings. 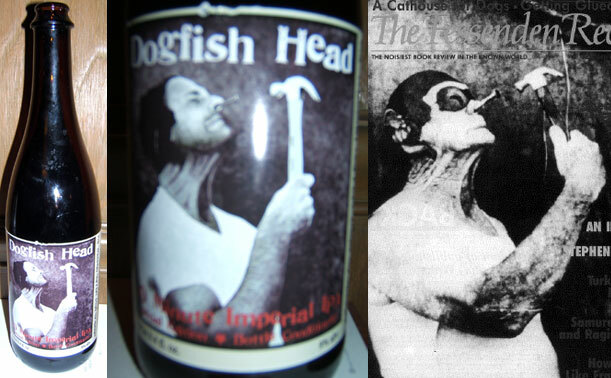 4) Dogfish’s second most popular beer behind its 60 Minute IPA, Dogfish 90 Minute IPA, was originally packaged in a bomber bottle that was graced with an image of a circus freak jamming a nail up his nose. Shortly after 90 Minute IPA was released, the photographer who took the image contacted Calagione to complain about unfair use. He wasn’t pleased until Dogfish sent him a bunch of beer and promised never to use the image again. 5) A 50-barrel brewery system Dogfish outgrew and sold in 2008 is now used by one of my favorite brewers, Northern California’s Russian River Brewing Co., makers of the elusive Pliny the Elder IPA. The first edition of Calagione’s book was published in 2005, but it was revised and updated in 2010. Surf on over to Amazon.com, where the paperback and digital Kindle editions both cost less than $11.00.